There are more important things in a sailor's life than time - the tides for example. Knowing their schedule is crucial for ever captain in order to keep the crew and himself safe. WEMPE tide clocks serve this exact purpose: time display of the tides. Of course they have a regular clock built in, too. 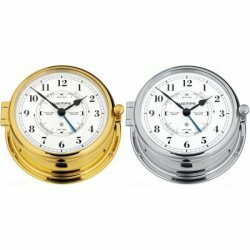 The WEMPE tide clocks of the ADMIRAL II Series are 185mm in diameter and available in two different editions, both with white clock face and black Arabic numerals. Customers have the choice between the colourlessly lacquered and chrome plated housing, both of which close with a toggle clasp. The tide index is located in the centre of the clock face. WEMPE tide clocks are not only used at sea, but are a popular accessory amongst residents of tidal regions. The tides often dominate everyday life so that a WEMPE tide clock with its appealing look certainly comes in handy. Time is often unimportant measure at sea, other factors dominate the life aboard. Such as the tides. Every captain must have precise information especially about the low tide in tidal areas. The WEMPE quartz tide clocks do not only indicate time, but also provide reliable information about the tides. The BREMEN II Series is extended with the WEMPE ship clocks with tide indexes in two types: colourlessly lacquered or chrome plated housing. Both versions have a 100mm white clock face with black numerals that is easily read. The tide indicator is placed in the centre. WEMPE tide clocks are also used on land in coastal regions, as the tides are an indispensable element of everyday life. Luckily, they come with fine outer appearance so that they are eye-catching accessories for every living room.